Though, professionals feel that in most cases, there is no specified cause for kidney stones, bowel inflammation which is chronic in severity is one of the main causes that can lead to stones in the kidney. This is a medical condition and cannot be controlled but knowing about the same can help you in the long run. A lot of studies have shown that dehydration of the body or lack of water and moisture in the body can be a major reason that leads to kidney stones. This solely happens because there is less water in the intestines and urine and thus the minerals that would have passed easily now gets concentrated because of lack of moisture and forms stones. This is undoubtedly one of the main reasons for the problem. There are a lot of surgeries that a person has to undergo in their lives. In case of ostomy surgery or intestinal bypass surgeries, one easily becomes highly prone to kidney stones. This might be a very rare cause but definitely one that deserves to be a part of this list. There can be many different health problems that can be the root cause of kidney stones. Dent’s disease, Crohn’s disease, renal tubular acidosis, medullary sponge kidney and hyperparathyroidism are some of the many ones that can cause the problem. Usually the color of the urine is transparent or a little yellowish. Apart from this any color urine can be a sign of kidney stones. This is supposedly one of the main symptoms of the problem and probably one of the first few ones. It gives an idea of the inflamed kidney as well. Another of the ways in which you can detect the problem of stones in the kidney is when there is a little blood while urinating. Though this is one symptom that can be giving a sign of various health problems, it is one sign of kidney stone as well with the rest of the ones mentioned here. Nausea and vomiting is one of the common symptoms that can be seen as a part of every disease symptoms list. With kidney stones as well, you will see pangs of vomiting at frequent intervals along with a feeling of nausea all the time especially during pain attacks. The intolerable pain in the abdomen and the inflammation of the kidney leads to a rise in temperature. Fever is one of the common signs of kidney stones. The temperature might not be very high but is definitely above the normal. 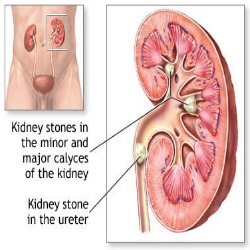 The stones in the kidney cause severe pain and one that is usually intolerable. This is one of the signs that totally confirm the presence of kidney stones in the body.